A great dissatisfaction with the government rests within society, yet the discussion continues to revolve around the same issues. In 7 essays, scholars propose that the real problem is size and scale, suggesting that the country is simply too big for one central government. This thought-provoking book begins a debate on how to divide it on a more human scale. Such scholars as Dr. Thomas DiLorenzo, Yuri Maltsev, Donald W. Livingston, Kent Masterson Brown, Marshall DeRosa, Kirkpatrick Sale, and Rob Williams contribute to the debate. In this thought-provoking collection, editor Donald Livingston presents seven essays addressing the modern paradigm of centralization. An outgrowth of the Abbeville Institute Scholars' Conference held in Charleston, South Carolina in February of 2010, this collection presents an exploration of state nullification, secession, and the human scale of political order. Scholars from a variety of backgrounds delve into such complex issues as nationalism, government by judiciary, the effects of size on the republican tradition, and natural progressions in rethinking nationalistic government. By returning to original source materials, including the Constitution, the essayists clarify topics as diverse as the source of nationalism and influences of early political figures, the role of size in government, and the disintegration of the Soviet Union with parallels evident in the United States. The essays provide clear evidence of the centralized government's ongoing power struggle with individual states. They offer concise justification for immediate action to preserve the sovereignty of member states while protecting all citizens from the ever-expanding federal government and restrictions on freedoms. As a collective, they provide a modern cautionary tale for the twenty-first century. About the Authors Editor Donald Livingston is an emeritus professor of philosophy at Emory University. He is the president of the Abbeville Institute, an organization of higher education devoted to the study of what is true and valuable in Southern tradition. Kent Masterson Brown is a practicing attorney who has argued cases in constitutional law before the Supreme Court and in several state supreme courts. Dr. Marshall DeRosa is a professor of political science at Florida Atlantic University and the author of several books on politics and the Confederate constitution. Dr. Thomas DiLorenzo is a professor of economics at Loyola University Maryland and a senior faculty member of the Ludwig von Mises Institute. His articles have been published widely in academic journals and major newspapers. Kirkpatrick Sale is the author of twelve books and director of the Middlebury Institute for the study of separatism, secession, and self-determination. Yuri Maltsev received a doctorate from the Institute of Labor Research in Moscow, Russia and served on the senior team of Soviet economists on Gorbachev's economic reform programs. He is a professor of economics at Carthage College and has lectured around the world. Rob Williams is the editor and publisher of Vermont Commons: Voices of Independence, an independent multimedia news journal. He is also professor of media/communications at Champlain College. Is the United States simply too big to govern? These essays begin the discussion. In 2003 Donald Livingston and a group of academics formed the Abbeville Institute, an organization of higher learning dedicated to a scholarly study of what is true and valuable in the Southern tradition. In 2010 the Institute sponsored a conference to focus on "State Nullification, Secession and the Human Scale of Political Order." Scholars from across the political spectrum came together to examine the unwieldy political strategy of centralization and the resultant expanding scale of government. This collection of essays grew out of that discourse, providing fresh insights at a time when the nineteenth-century nationalistic language of "one and indivisible" is losing its salience. Kent Masterson Brown demonstrates that the Constitution ratified in 1789 was, and is, a compact between distinct political societies. Marshall DeRosa reviews the current revival of states' rights in the Tea Party movement. Thomas DiLorenzo examines the transformation of a federative constitution grounded in state sovereignty into a nationalist constitution in which the central government defines the limits of its own power through judicial review. Donald Livingston explores the question of size, scale, and true republican government in historic context. Yuri Maltsev brings forth the modern secessionist example, discussing in depth the peaceful separation of fifteen states from the Soviet Union and the lessons to be learned by thoughtful Americans. Kirkpatrick Sale seeks to raise awareness that the republican values of self-government and rule of law cannot exist unless certain conditions of size and scale are satisfied, while questioning what the optimum size should be. Rob Williams examines secession as it exists today, providing a substantive history of the movement and its introduction into the mainstream discussion of runaway centralization. Donald Livingston is a professor of philosophy at Emory University. He has published two books on the British philosopher David Hume and has been described as "the greatest Hume scholar of the twentieth century." He worked with other academics to form the Abbeville Institute, an organization in higher education dedicated to scholarly study of Southern tradition. This challenging essay collection examines alternatives to the United States government, which is now a centralized, unitary state with almost unlimited powers over its citizens. Seven essayists are concerned with remedies for the size to which the U.S. has grown in population and territory and the impossibility of the centralized U.S government being truly responsive to its citizens. An eighth explains how economic policies can cause national collapse as well as regeneration. Donald Livingston, editor and essayist, notes that their question is posed at a time when "Many political, business, and cultural elites are shifting their allegiance away from their nation-states to supranational entities." Livingston notes, however, that George Kennan, architect of U.S. policy to contain the Soviet Union, argues that the U.S. has become too big for the purposes of self-government. The U.S. now rules more than 305 million people, by imposing one-size-fits-all rules, which result in a "diminished sensitivity of its laws and regulations to the particular needs, traditions, ethnic, cultural, linguistic, and the like of individual localities. " Size, Kennan says, has encouraged an abstract ideological style of politics that favors universalistic, egalitarian solutions applied across the board to all parts of the population. "Particularly is this true of the United States, with its highly legalistic traditions, its dislike...of any sort of discriminating administration, its love for dividing people into categories, its fondness for regulating their lives in terms of these categories and treating them accordingly, rather than looking at the needs of individuals or of smaller groups and confronting these on the basis of common sense and reasonable discrimination." Livingston says, "Congress is more interested in the struggle over how to spend $5 trillion in a single year than in tackling politically controversial issues and has turned these over to the federal courts." Kennan's concern with size is not about reducing U.S. spending, or bureaucracy, but with the territorial division of the U.S. into a number of smaller political societies. He thinks there should be public debate about how the U.S. might downsize a government that has become too large to enable self-government by its citizens. The goal is to achieve ease, flexibility, and intimacy of government. 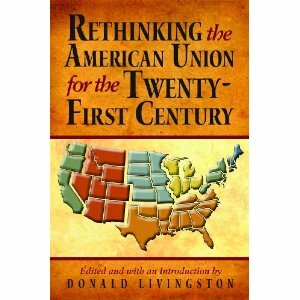 The essays in this book, Livingston notes are a contribution to that discussion. Kent Masterson Brown's essay explains why secession was and is a legal, constitutional remedy, by states, to protect their citizens' freedoms. He also refutes arguments by those that claim the U.S. was created as an indivisible union. Thomas DiLorenzo, reviews John C. Calhoun's fear that constitutional provisions that limit U.S. governmental powers were insufficient, because those for whom the protections were provided were given no means to enforce them. Calhoun wrote that the party controlling government shall always oppose any restrictions on its powers. They "would come, in time, to regard these limitations as unnecessary and improper restraints--and endeavor to elude them." DiLorenzo writes that, at the constitutional convention, Alexander Hamilton proposed a permanent president or king that would appoint all governors and be able to veto all state legislation. Hamilton's suggestions were discarded, but as the new government began to operate, he and others that favored a nation instead of a federal government found ways to pervert the constitution to serve their view. The term "implied powers" was coined by Hamilton and used by centralizers to undermine federalism. DiLorenzo says, "All the worst tyrants in world history have been enemies of federalism and states' rights and champions of consolidated or centralized state power." He notes that Southerners were the only Americans to seriously challenge the nationalist theory, and recapitulates military and civilian deaths, crimes against civilians, and property destruction caused by Lincolns War, which he says were amongst the greatest war crimes in world history. Following Lincolns War, "Americans became the servants rather than the masters of their government and have been miseducated about their own political history every since by the state's many court historians." "It is this miseducation...that serves to prop up the centralized, neo-mercantilist empire..."
Marshall DeRosa writes about attempting to revive the U.S. Constitution's 10th amendment, which supports the principle of federalism by providing that powers not granted to the federal government nor prohibited to the States by the Constitution are reserved to the States or the people. He notes that a major block to reviving this amendment is that the U.S. government, mainly the Supreme Court must approve such a request. He says the motive for stripping the 10th amendment of its original meaning was to legitimize "imperialistic public-policy interests of a nationally based ruling class". He explains how and why the general government created by and for sovereign states became an involuntary association of states dominated by the U.S. government and sanctioned by the U.S. Supreme Court---a court that has left it to Congress to decide limits on its own legislative powers. DeRosa reviews U.S. economic imperialism and notes similarities between post-war U.S. economic exploitation after Lincolns War, the Spanish-American War, and World War I. He says political rhetoric incapacitated clear thinking about Lincolns War and Lincoln's rhetorical statements have since been essential to ensure Americans are willing to "`make the world safe for democracy' by foreign interventionist excursions." However, he says, Woodrow "Wilson's imperialistic policies, domestic and foreign, would have been improbable without the centralization of power in the chief executive." And Lincoln was the president most responsible for that consolidation of executive power. He explains Lincoln's actions that ignored constitutional law and how they were made palatable to many by the inclusion of abolition in them. Even so, they served the Republican Party's business interests. In that way, ruling-class interests and abstract justice overwhelmed reasoned opposition. Lincoln considered the Union to be an aggregate of the American people, in which the numerical majority can bind the minority. Political situations affecting Supreme Court case law and the post-bellum South show the destructive effect Lincoln's view had on the rule of constitutional law. DeRosa cites important examples that undermined the 10th amendment and sees, in Pres. Barack Obama's Patient Protection and Affordable Care Act of 2010 "the latest rendition of uncontrollable centralization" begun by Lincoln. DeRosa says,"The U.S. Supreme Court facilitated and is a partner in this tyrannical accumulation of powers to the national government." His curative for centralization is enforcement of states' rights, but "the original meaning of states' rights has been replaced with a dominant nationalism by the very nationalistic forces it was designed to thwart." Therefore, states should rely on their own constitutions to enforce the 10th Amendment and accomplish decentralization. He then quotes Jefferson, "To consider the judges as the ultimate arbiters of all constitutional questions [is] a very dangerous doctrine indeed, and one which would place us under the despotism of an oligarchy...The Constitution has erected no such single tribunal..."
Donald Livingston's essay states the thesis that limited size is a requirement for republican government and beyond a proper size it becomes dysfunctional. He describes "some of the most important ways the republican tradition has tried to define the proper size and scale of republican politics, how Americans contributed to that effort, and how they eventually abandoned it." In reviewing political organizations, he notes that republican tradition for more than 2,000 years was that republic's populations should be small: about 200,000 people. He discusses a political organization propounded by Jefferson: the division of states into smaller states and counties into smaller, self-contained governing units. That would have resulted in a large number of Swiss-style federative states. But America did not do that "and in time would collapse into a greater centralization of power that anything eighteenth-century monarchs could have imagined. He says a republic has plenary powers over individuals and is small, and a federation is a voluntary, symbiotic relationship between sovereign states, a central authority, and is large. That, he says, leaves the question of whether republican-style politics can be in effect in a large state that is not a federation. Livingston relates David Hume's suggestion, in his essay "Idea for a Perfect Commonwealth" and compares it with the U.S. Congress. Hume's plan would result in one representative for every 900 people, while a U.S. congressman is currently supposed to represent 700,000 people, "which is not even remotely within a republican scale". To reduce representation to 900 people, there must be 5,000 representatives, which "would be impossibly large for a lawmaking body". "(W)e have evidently reached the point where talk of republican government is utterly meaningless." Livingston cites George Kennan's proposal that the U.S. "downsize through secession and division into a number of federative units on the continent forming a voluntary commonwealth of American federations. He also states his support for a Hume-like plan to abolish the House of Representatives and make state legislatures a joint national legislature. He notes that most regulations are currently not enacted by Congress, but written by bureaucracies of the executive branch, and the Supreme Court, through judicial review, has usurped states' powers over law enforcement, morals, speech, religion, education, health, and voting, "which constitute the essence of republican life". Five of nine unelected, life-tenured Supreme Court justices can make law for 305-million people. The court can and has rewritten the Constitution and by-passed the amendment process. "To speak of republican self-government and rule of law in such a regime is Orwellian." Livingston thinks most members of the Tea Party Movement think that gaining control of the three branches of U.S. government will solve their problem. They have difficulty thinking of state inter-position, nullification, and secession as choices. "Instead, they hope to gain control...so that they can do unto others what has been done unto them." They have forgotten republican tradition's teaching about the necessary connection between self-government, the rule of law, and a human scale to political order. The Tea Party Movement should recall Kennan's suggestion that the U.S. be divided into territorial jurisdictions so as to make republican government available to Americans. The U.S. union, he says, was "never intended to be an end in itself...It "was, and should be, an instrument for the benefit of republican liberty in the States and local communities. Secession should again be considered, as well as State inter-position and nullification to protect States' citizens from unconstitutional acts by the central government." Kirkpatrick Sale says that a state with a large amount of democracy and efficiency is a good state. He says the U.S., a state with 305-million people is ungovernable, and cites a multitude of U.S. problems to support his statement. Only secession, he says, can form the basis for re-ordering the U.S. political world. Sale proposes a Law of Government Size, which is that "Economic and social misery increases in direct proportion to the size and power of the central government of a nation." He cites Arnold Toynbee's conclusion "that the next-to-last stage of any society, leading directly to its collapse, is `its forcible political unification in a centralized state." He says, "The consolidation of nations into powerful empires leads not to shining periods of peace and prosperity and the advance of human betterment, but to increasing restriction, warfare, autocracy, crowding, inequality, poverty, and starvation." Sales then explains how this happens. He also says "thirty-one of the States (plus Puerto Rico) fall in a range where similar sizes in the rest of the world have produced successful independent nations. Those are candidates for successful secession." The U.S. government, Sales says, "is broken and cannot be fixed". He says, "The only way to re-create vibrant democracies" envisioned by the founders it "through peaceful, popular, powerful secession." Yuri Maltsev's essay explains principles of the Ludwig von Mises school of economics. He writes that the collapse of the U.S.S.R. "exposed the total bankruptcy of big governments based on central planning and an overregulated command economy: the U.S.S.R. was too big not to fail." Malsev reviews events leading to the end of the U.S.S.R, and its final dissolution and current economic and political direction. He presents information to prove that socialism did not and can not work. He notes, however, that a "sad legacy of Marxism is the mindset of certain people east and west who still believe that only the Big State could cure economic ills and achieve social justice". He says the U.S. are close to the model of fascist Italy and Germany, "as are most centralized Western welfare states with confiscatory taxation, nationalization of major industries and the financial sector, affirmative action policies, environmental regulations, and other policies undermining property rights." Limitations on property rights by welfare state policies and regulatory requirements, in the U.S. and most modern states, he writes, harm their economies "to the extent that regulation reduces natural comparative advantage and the real growth potential of the economy". In his essay, Rob Williams tells about a secession movement in Vermont and its likelihood of success. He writes, "The prospect of breaking away from a union once consecrated to liberty and justice but now degenerating into imperial putrefaction will only grow in appeal as we go marching with our Patriot Acts and National Security Strategies through Iraq, Iran, Afghanistan, and the frightful signposts on our road to nowhere." He says non-violent secession is warranted because the U.S. is no longer a self-governing republic responsive to its citizens needs and concerns but "an uncontrollable Empire governed by an unholy alliance of transnational corporations and a federal government bought and paid for by the same." Williams quotes Scott Naylor, a secession advocate, who thinks the U.S. could eventually collapse due to a failure of moral authority. He cites extensive evidence of U.S. imperialism for the benefit of large corporations and "banksters". The U.S. is, he says, a fascist state, for in it there exists (quoting Benito Mussolini's definition of fascism) "a monopolistic merger of Big Business and the power of the State". Unsolved problems that affect U.S. citizens are myriad and there is no evidence U.S. governments want to solve them. Williams relates the growth of interest in secession and activities done to further it. He says a U.S.-wide Zogby poll, in 2008, showed 20% of the population supported the right of any state or region to secede from the U.S. and become an independent republic. He reckons Vermont is the U.S. state most likely to secede, but knows secession is yet just a long-term goal. Interesting aspects of Williams essay include the deep understanding he says persons involved with the Vermont secession movement have developed of the constitutional right Southern states had to withdraw from the U.S. and create the Confederate States of America, as well as the legal right all states retain to secede.